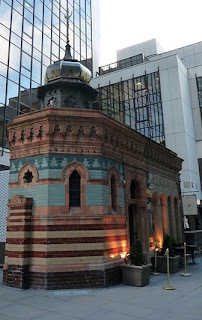 Come on the Lambeth Cyclists' Archtecture this Saturday, 26 May 2012, when we be looking at Oriental infleunces on London architecture. London's estuary faces east and for centuries influences and people have flowed in from that direction. On this ride we'll be exploring some of the curious traces this oriental tide has left on London's architecture. We'll be looking at eastern and middle-eastern influences on buildings ranging from temples and mosques to cigarette factories, cinemas and suburban villas. 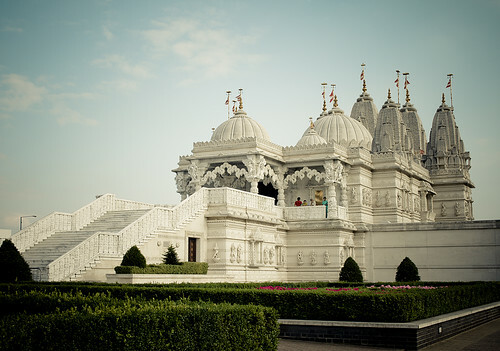 We're beginning with a tour of the Shri Swaminarayan Mandir, the great Hindu temple in Neasden, which means a slightly earlier start than most of our rides, as we need to get there in time for a 10.30 tour. Meet Euston station, by the ticket office on the left-hand side of the concourse, 9.40am, to get the 9.57 train to Harlesden, arrive 10.13. (It's a Watford Junction-bound train). Bring Oyster cards, or buy a train ticket. After the temple visit, we'll travel back by train to Kilburn High Road to continue the ride. Finish - near Covent Garden c 4.30. Dress - For the visit to the Mandir, there are some dress requirements - so no exposed midriffs, nothing see-through, and no shorts or skirts above the knee - though sarongs can be provided.